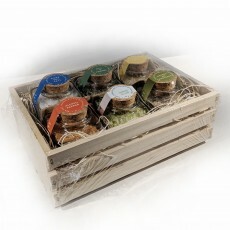 The perfect gift for yourself or your food lover! Choose between a collection of eight 1-ounce jars or six 2½-ounce jars of our pure, infused and blended finishing salts nestled in a bed of wood excelsior in a custom-made wood crate. A superb presentation of an assortment of our extraordinary finishing salts! Each wood crate contains a selection of our finishing salts we will handpick from our current offerings. If you have any flavor preferences, please note them in the comment box at steps 4 and 5 of checkout and we will try to accommodate your request; some blends may be unavailable and we may be unable to accommodate your entire request. Crate measures approximately 8 " x 5½" x 3"